I was interested in the neutral state between the poles of objects; how something very ordinary like a pencil with a rubber on the end is an object which both creates and destroys itself. This lead to the bigger idea of creation and death but in reality unlike a pencil it is a perpetual cycle, an idea united across science, religion and mythology. I am obsessed with the Moon - our controller of time and tides and the object of many ancient rituals. Yet it is leaving us, at a rate of 3.7cm/year. This seems relatively small and yet, in my lifetime it has left me, personally, over 1m behind! I wanted to quantify this universal data in a domestic way so I could feel a daily connection between me and 'it'. “Jelly responds to an electroencephalograph (EEG) in nearly the same way as a healthy human brain." No-one has ever been able to firmly define what ‘living’ is. Scientists have made attempts to factually rationalise life and yet with advances in research it keeps changing, most recently with the discovery of the ‘virus’, which opened the argument that all living things breathe. So, this continuing evolution in definition along side our progress in biology makes me think maybe this is not a question with a scientific answer, but a philosophical one where people project life into what they choose. 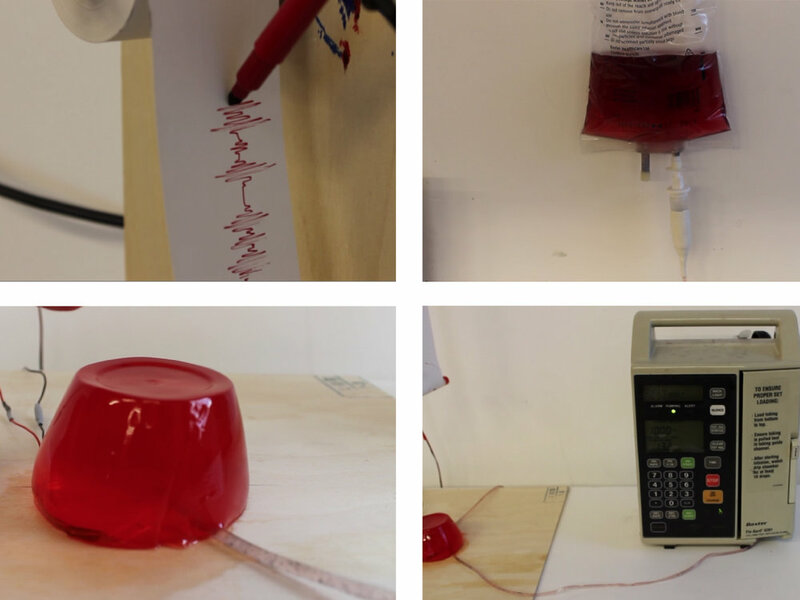 This project was an installation based on the findings of Neurologist Upton, and the ridiculousness of the fact that using an EEG, a scientific measure of human life (or at least brain activity) you would not turn a jelly's life support off in a hospital. I built a '6 barrel gun' which could be loaded with party poppers and the trigger would shoot them at once to create a sizeable explosion. To start with I filled the party popper 'bullets' with powder paint and shot them to see if the force would be strong enough for different materials. I started to think about modern impatience and people wanting things instantaneously. One product of this behaviour is the Fast Food industry. Even now with entire meals being delivered in less than 3 minutes, people want it in 60 seconds. I created a fictional Faster Food Restaurant where people could shoot their food to create it - the cuisine of choice: Pizza! The Pizza Connection was the longest criminal jury trial in US history ending with all but 1 of the 22 defendants being convicted. It was a case about a branch of the mafia who owned many pizzeria chains around USA who would actually be selling drugs and laundering the money back into Italy - a convenient marriage of weapons and fast food.